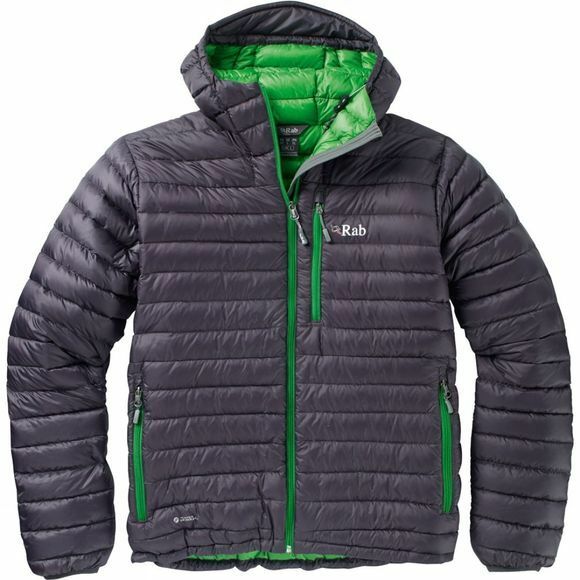 With superior quality, 750 fill hydrophobic goose down insulation wrapped up in durable, weather resistant Pertex outer fabric, the Microlight Alpine Jacket offers maximum warmth for minimal weight. The narrow baffle structure minimises down migration and provides optimum loft. The hood and even the zip baffle are down-filled, for all-over protection from cold and windchill, and it packs into the chest pocket for minimal storage. Clean lines and uncluttered, simple design make this down jacket ideal as part of the layering system for climbing or alpine adventures, but this versatile piece is equally at home for day to day use or for lightweight backpacking. The Microlight Alpine Jacket is the perfect choice when warmth, weight and packability are important considerations.